But I've always said that no one timeframe is better than any other. There are professional traders operating across the full spectrum, from watching the tape move tick by tick, right up to daily and weekly charts. There is no "best"; only what is best for our own personality, needs and circumstances. And I've always said that the ideas expressed in the YTC blog (and also in the YTC Price Action Trader) are applicable across all timeframes. Ok… maybe not the screen-watching ideas from last week's article. But the VAST MAJORITY of what I discuss can be applied to other markets and other timeframes, with only a little extra thought about how it might be adapted. So I absolutely LOVE getting emails from traders who realise this fact. And who have applied the ideas. And who have found some success. Here is an extract from an email conversation I had during the week with Anatoliy, who trades forex markets on daily timeframes. 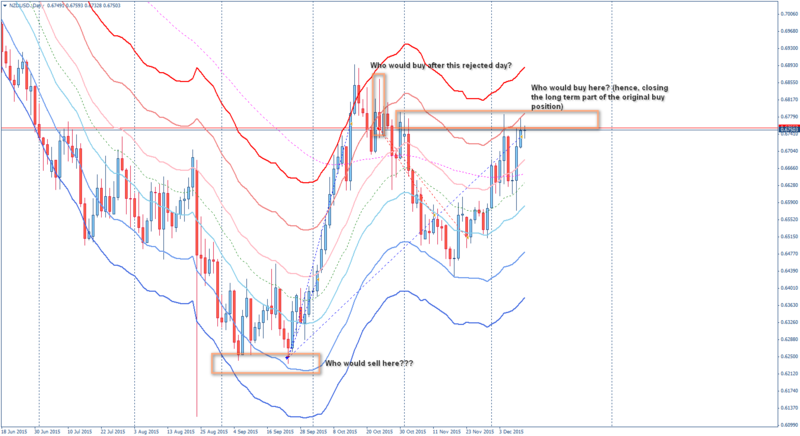 I've been reading your blog for more than a year now, and along with Trading in the Zone it's been one of the bigger reasons for considerable improvement in my trading. Even though I am hardly ever looking below D1 timeframe, the principles all stay the same. 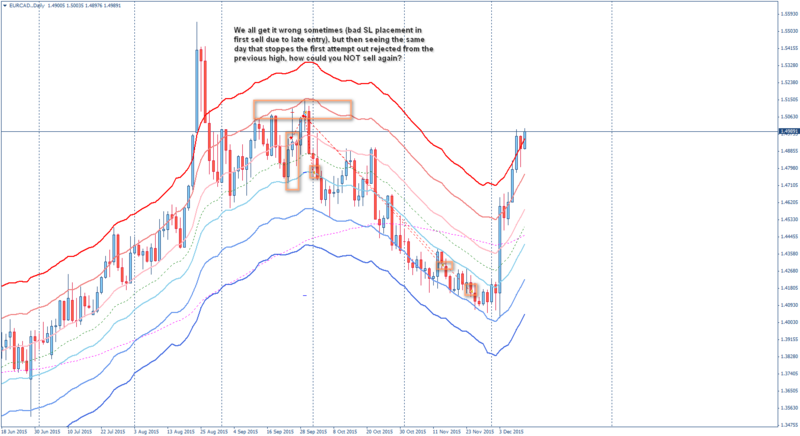 Trading long term allows me to analyze all 28 major forex trading pairs for entry opportunities. The post is so simple, but I have to say, it is one of my favorites. There are at least 5 long term entries I am taking per month just based on this principle. Thank you once again for sharing all your knowledge, experience and ideas. There were two images attached to the email. I've had to shrink the images to fit here. If you click on the images, they will open a full-size copy in your browser. The first thing you'll notice is that the workspace template is different to what I use, through addition of a Keltner Channel (or similar). That is not necessary for the point of today's article. Anatoliy has marked the areas of interest via the rectangles and associated text. You'll find the trade entry and exit markers in these areas. Look to these areas and see if you can see what Anatoliy was seeing, in making both his entry and exit decisions. (a) The EXCEPTIONAL reward:risk ratio that can be achieved through gaining entry at the edges of the market structure. (b) The way that Anatoliy has used the blog post concept (who would BUY here) to not only enter the market, but to also time the exit. Specifically, see the RHS comments in the second image (NZDUSD chart). Again, the vast majority of what I discuss on my site can be adapted, with only minimal effort, to other markets and other timeframes. 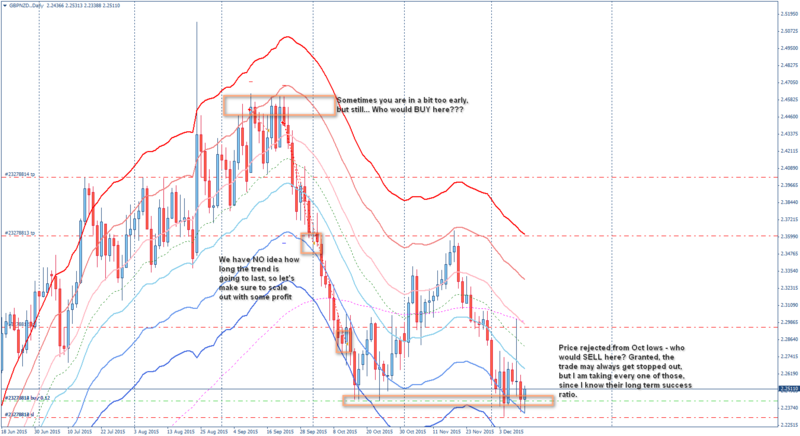 The entry date/time in Anatoliy's trades shows that he didn't learn the concept from my blog post. Rather, my blog post simply confirmed for him the truth that had already become evident through his own hard work. And perhaps described it in new ways. That's fantastic. Here, in these extracts from further email correspondence, Anatoliy describes the process he used to come to these conclusions (my highlighting). Once again, I am showing this to you because you really helped me to move forward with my trading. 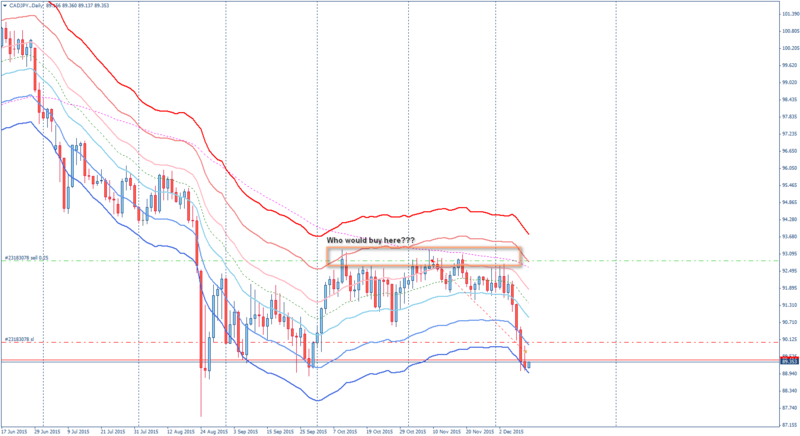 Not only with your price action articles, but also on how to organize one's trading AND especially meta game. I've been involved with the markets for almost 11 years now, developing the same trading system that suits me. Two missing ingredients for me through the years were Trading in the Zone and your blog. In the beginning I was a little bit unsure if your super low TF trading will work for me, since I could never work below H1 (I tried many times, thinking how great it would be to have a couple trades every day, but I just CAN'T do it. 😀 ) However, as I continued watching my Daily TFs and reading your blog, I saw that it is really all the same. I've been using contrarian entries long before, but you really helped me to put it into a system with your meta game explanation. My own trading system was always based on currency correlation (I call it "Whole Market") and it was quite contrarian, as I was trying to catch the very start of every big trend. A couple years ago "contrarian" meant to me selling every new high and buying ever new low! 😀 Thanks to your blog I was able to start the study of price action and differentiate between a new high with good probability of a follow through even higher, and a new high where smart money are going to join me fading the weak move. Here's a task for you to consider. For the next month or two, find charts every day which allow you to study this concept – new highs or lows which follow through further vs new highs or lows which reverse. Print them out. Add notes. File them in your Market Structure & Price Action Journal. Review them. And develop your own rules-of-thumb for finding areas which scream out to you, "Who would BUY here???" or "Who would SELL here???". Anatoliy has been kind enough to share two further trades based upon this same concept. This time both show imperfection at the time of entry (the reality of the trading game) with a stop out and re-entry in one and a scratch and re-entry in the other. Both examples perfectly demonstrate the exceptional reward:risk ratio obtained through entry in these wholesale price regions, as the second entry moves nicely to a multiple-R profits. Again, look at the charts and see if you can see what Anatoliy was seeing at the time of entry.